The above view of Jupiter, taken by the JunoCam imager of NASA’s Juno spacecraft, highlights Oval BA -- a massive storm known as the Little Red Spot. Despite its unofficial name, the Little Red Spot is about as wide as Earth. The storm reached its current size when three smaller spots collided and merged in the year 2000. 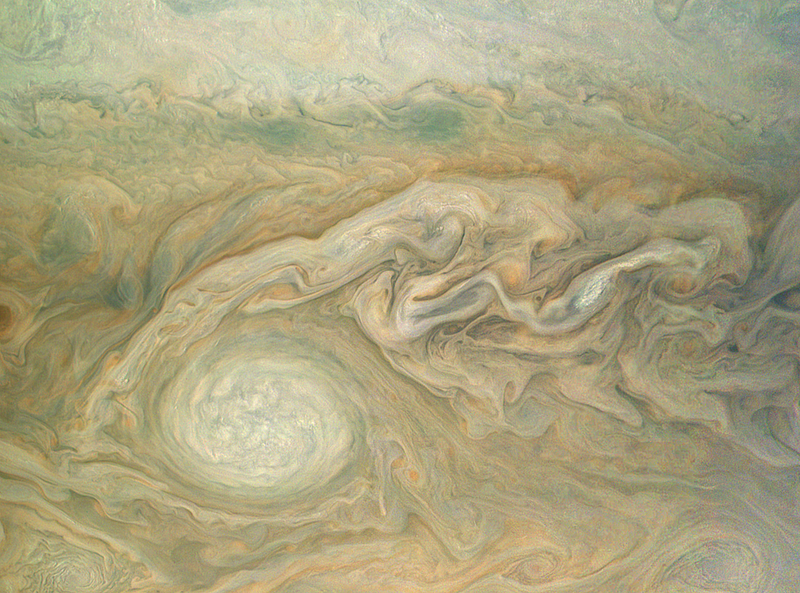 The Great Red Spot, which is about twice as wide as the Little Red Spot, may have formed from the same process centuries ago. Juno acquired this image on Feb. 2, 2017, at 6:13 a.m. PDT (9:13 a.m. EDT), as the spacecraft performed a close flyby of Jupiter. When the image was taken, the spacecraft was about 9,000 miles (14,500 kilometers) from the planet. This enhanced color image was processed by citizen scientist Bjorn Jonsson. Juno launched on Aug. 5, 2011, from Cape Canaveral, Florida, and arrived in orbit around Jupiter on July 4, 2016. During its mission of exploration, Juno soars low over the planet's cloud tops -- as close as about 2,100 miles (3,400 kilometers) During these flybys, Juno is probing beneath the obscuring cloud cover of Jupiter and studying its auroras to learn more about the planet's origins, structure, atmosphere and magnetosphere. NASA's Jet Propulsion Laboratory, Pasadena, California, manages the Juno mission for the principal investigator, Scott Bolton, of Southwest Research Institute in San Antonio. The Juno mission is part of the New Frontiers Program managed by NASA's Marshall Space Flight Center in Huntsville, Alabama, for the Science Mission Directorate. Lockheed Martin Space Systems, Denver, built the spacecraft. JPL is a division of Caltech in Pasadena, California. MEDIA MONDAY / EXACTLY WHAT DID QATAR DO WRONG? MAYBE WE CAN AGREE ON THIS?